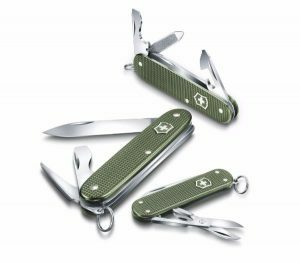 Supreme elegance in 2017 – the Alox Limited Edition 2017 release from Victorinox features three of the most popular pocket knife models in the Alox range with scales in this exciting new colour. Adding a touch of colour to everyday life is simplicity itself. 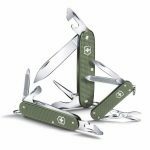 In response to a number of customer requests, the family-run Swiss company Victorinox is releasing limited runs of its most reliable and popular models for the third time – the scales of the Classic, Cadet and Pioneer come in an exclusive Alox olive green for the Alox Limited Edition 2017. The Alox Limited Edition 2017 marks the next chapter in an exciting story. These three Alox models are set to be produced in an ever-increasing range of new colours. 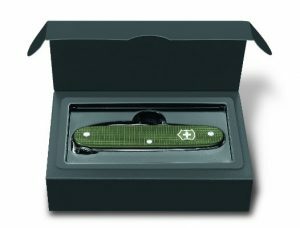 Each new edition will only be available for one year – with the relevant year engraved on the back of the pocket knife. A certificate will also be supplied with each model. 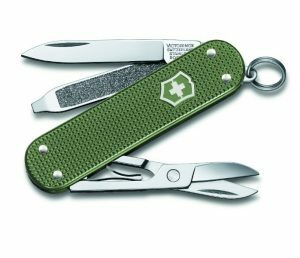 Background: Up till now, most Victorinox Alox models have come with silver anodised scales. These are punched from aluminum and embossed with a ribbed pattern. The Eloxal process is then used to create a resilient and abrasion-resistant oxide layer to provide extra protection against damage and corrosion. This layer, coupled with particularly strong rivet joints to hold the tool together, gives Victorinox Alox models an exceptionally robust design. Then there’s the tried-and-tested mechanism and the unbeatable production quality of these Swiss-made knives. The result is a series of virtually indestructible pocket knives. This explains why Alox knives have gained such a dedicated fan base – in the truest sense of the word. Models produced in different colors as part of rare limited releases have become prized collector’s items. And that is why there’s been a riot of colour since 2015! At a length of just 58 millimetres, the Alox Classic Limited Edition 2017 features a blade, a nail file, a screwdriver, scissors and a key ring, and thus makes an ideal companion for everyday use – elegant and robust. The Cadet Alox Limited Edition 2017, at a compact length of 84 millimetres, is the “gentleman” of the Alox range – it features a nail file including a nail cleaner, along with a versatile, highly stable blade and other useful tools such as a bottle opener and a can opener. The Pioneer Alox Limited Edition 2017 is an exceptionally reliable tool that you can count on wherever you go. The 93-millimetre model includes a blade, a reamer/punch, a can opener (with small screwdriver), a bottle opener (with large screwdriver and wire stripper) and a key ring.